The apartment was spacious and modern. It was located right at the water and there was easy snorkeling access as well as easy walking distance to town. This apartment had a very large sleeping room and the king bed was very comfortable. There was also plenty of shelf space for our things so we could unpack our suitcases. The hostess, Moea, was absolutely wonderful. She made herself available to drive us anywhere, made dinner reservations and arranged a snorkeling tour for us. In addition, I had a medical need and she came immediately and drove us to the Dr's office and didn't leave until she knew we would be seen. She spoke excellent English. A great location, right on the water but also in walking distance of shops. Harry (Arii?) picked us up on time at the Vaitape dock and took us to the property to check-in. Then he was kind enough as to drop us at Matira beach and even offered to come back to pick us up (we ended up taking a taxi back, couldn't take any more sun). He was very nice and friendly and offered a lot of good advice about the island. The apartment was large with a nice view of the bay and close enough to walk to the Hawaiki Nui's night ball, so it served its purpose. Close to supermarkets and shops as well. A bit pricey for what it offers, but this is Bora Bora after all. Huge apartment right on the water with very large kitchen well set up for cooking. Nice location though passing by motor boats create unexpected noise. Spotless clean well stocked appartment with tasty decor. Wonderful view over the bay. Huge apartment with large bedroom, living area, large kitchen, and large porch. Shower comfortably warm and powerful. Walking distance to town. Host very friendly, helpful, and did laundry! Our host Gerard met us at the boat dock and delivered us to our unit, stopping at the local grocery along the way to allow us to shop for our initial provisions. Gerard picked us up at dock and delivered us to our two villas. Our grown boys were on the hill, while we were on the waterfront (harbor next to gas station where boats refuel). He had booked us two excursions and a car, which was helpful. The rooms were basic, but comfortable. Comfortable bed. Electricity in bathroom, which does not always happen in France, was nice. Owner speaks English, was flexible in check-in & out times and offered transportation. Nice bay view. Air conditioner worked well. Lock in a great price for Sunset Hill Lodge – rated 8.6 by recent guests! Sunset Hill Lodge This rating is a reflection of how the property compares to the industry standard when it comes to price, facilities and services available. It's based on a self-evaluation by the property. Use this rating to help choose your stay! 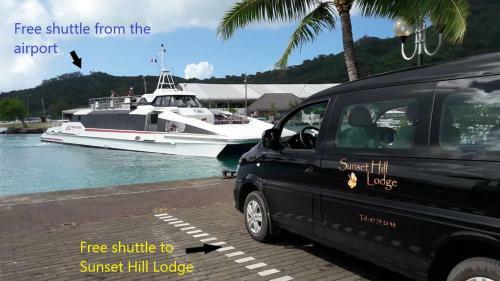 Offering free WiFi in a dedicated garden lounge, Sunset Hill Lodge provides self-contained apartments on the waterfront or on the hill side. 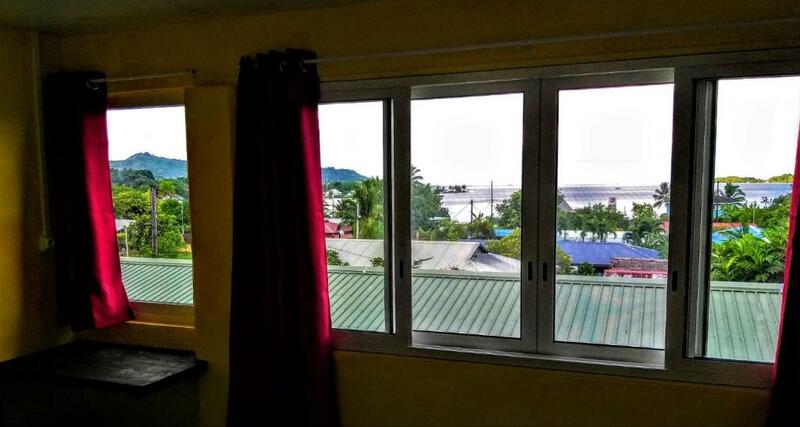 All rooms boast picturesque sea views. 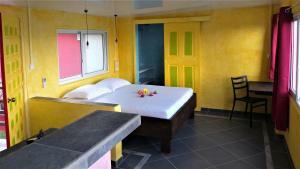 Sunset Hill Lodge is within 5 minutes' walk of the shops and restaurants of Vaitape city center. Guests can enjoy hiking in the surrounding areas. Each apartment features a kitchen with a stove top, microwave and a refrigerator. Private bathrooms feature a shower. Towels and linen are provided. A hairdryer and laundry facilities are available upon request. When would you like to stay at Sunset Hill Lodge? This apartment features a dining area, and a kitchen with kitchenware. 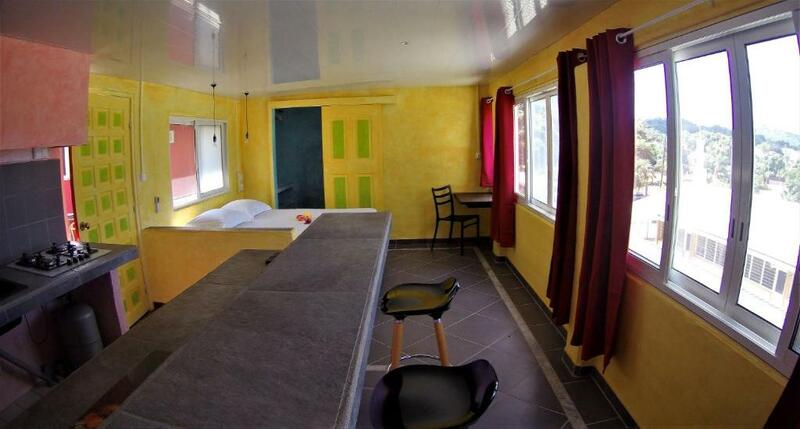 This apartment features a seating area, an electric kettle, and a microwave. This apartment features a dining area, kitchenware and a stove top. Please note the 2 single-size beds will be on the terrace protected by mosquito nets. This studio has a private entrance, kitchenware and toaster. This studio has a private entrance, kitchenware and tumble dryer. The balance of the stay is payable on arrival in cash exclusively, xpf, Euros or dollars. House Rules Sunset Hill Lodge takes special requests – add in the next step! Sunset Hill Lodge accepts these cards and reserves the right to temporarily hold an amount prior to arrival. Payment via PayPal or bank transfer is required within 48 hours of booking. For further information please contact the property in advance, using the contact details found on the booking confirmation. Please inform Sunset Hill Lodge of your expected arrival time in advance. You can use the Special Requests box when booking, or contact the property directly using the contact details in your confirmation. We had a funny issue with a crab who was under the mattress The rest it was cool. Friendly People very helpful. Gerard Was very kind. Moea also helped us a lot to be comfortable and provided us information about the place. Self contained accomodation right on the water at Bora Bora lagoon. Easy access to the water right on the doorstep. Basic but kitchen has all we needed. Air conditioned bed room. Free airport shuttle. Great view of all the activity on the lagoon from the porch sitting area. We were disappointed that there were absolutely no supplies in the apartment such as paper towels, kleenex, shampoo or body wash, bar soap. There were only 2 large towels - no wash clothes or hand towels. The air conditioning was in the large room but only marginally kept the kitchen/ eating area cool. There was no ceiling fan in the sleeping area. The colors of the apartment were rather loud but guessing that may be a Tahitian thing. A bit isolated, although thé proprietors were very helpful in offering rides. Could have had some small amenities--hand soap, small trash cans. Steep stairs making getting suitcases up a challenge. I loved everything but especially the beautiful balcony/ relaxation area - perfect views for after a day of swimming and snorkeling! Great location and Gerard was a perfect host! Gerard (whom we never met in person) was nice at first during the first email communications, but then seemed bothered when I tried to get more info about the Hawaiki Nui va'a competition. He even went as far as saying he knew as much as me about it. I find that hard to believe (he's a local after all) and very rude to say the least. He could have simply said he didn't know much about it, or point me to a website. Anyway I got all the info I needed from the other place we stayed at (Village Temanuata, highly recommended!). Apartment had roaches. I’d have appreciated some curtains or blinds on the glass doors as I’m not used to getting up with the dawn! The owner and his employee literally couldn’t do more for me: the property is close to the town but not Matira beach so there were lifts anywhere I wanted and at any time, the owner invited me into his home and even insisted I leave with food and they organised tours for me and changed them around when my plans changed. You’re treated like a guest in the owner’s home. 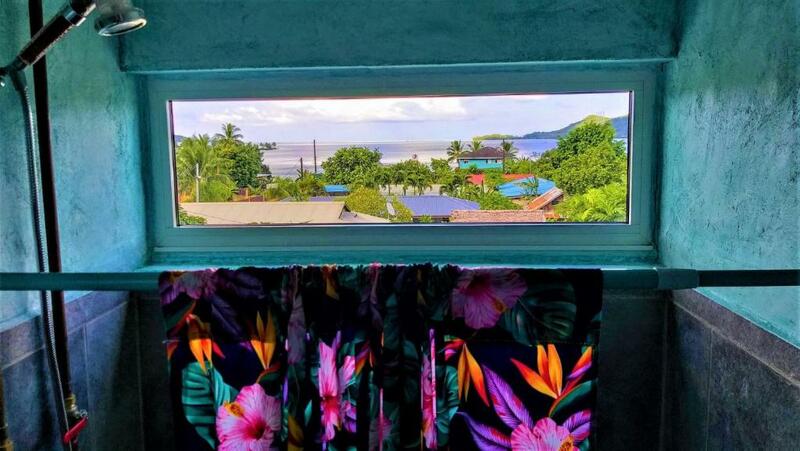 Warm host, convenient location, clean place, nice view, good value. Easy to communicate, taking care of us from pick up until we depart, very helpful all the time. 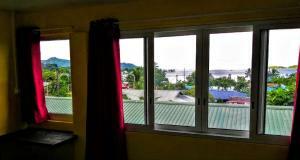 The sea view apartment by the sea is absolutely a best place to stay. Location is very good. not far from the airport shuttle/centre, the shops/supermarket by walking distance. The host Arii is very nice, and take good care of us. We booked a day tour online, but the company decided to cancel on that morning, he then helped us to arrange the tour immediately. Very warm and nice guy. The lodge is very clean and tidy, with a very big balcony and sea view. Perfect for our stay, we can enjoy our meal with the beautiful scenery. You can also have the view of Mount Otemanu from the kitchen. Excellent lodge and host and location! very valuable price!!!! When the Internet was available it barely worked. Only 1 of our 4 devices would connect & that was when we stood in the neighbours garden. Would definitely recommend a WiFi extender. No hot water. Good size apartment & comfy bed. Good aircon. There is no TV which one thing missed. The studio is bigger than we think. with a nice and big terrace, WIFI, A/C. The bed is comfortable with all the equipment for the kitchen. The location is good. Just near the Total petroleum station in the downtown of Borabora. Good service and friendly people. We do recommend it.